We are delighted to announce you that Marockin’ Brass is releasing a new album ‘Beats & Pieces’ on October 19, 2018. 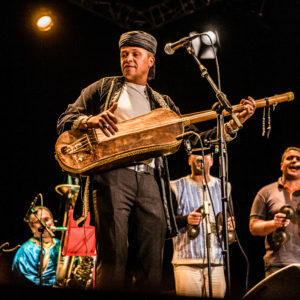 The gnawa-jazz band invited the talented producer Sofyann Ben Youssef to contribute to their new sound. You are more than welcome to discover this during an in-house concert at MetX! You can expect some steaming gnaoua or sweaty shaabi-funk accompanied by some redhot brass that will blow the sand out of your ears! After the concert of Marockin’ Brass, there will be a performance by the trash-drumband VelotroniX and a DJ-set of Rebel UP!, the global DJ collective that is releasing ‘Beats & Pieces’ on their label Rebel Up! Records.